I hope you’re doing well? It’s so sad to say that my time in Leeds is nearly over, before I go Haydn and I have decided to do a little blog post together. In today’s post I’ll be showing Haydn all the products I use for a full face of makeup whilst he tries to guess the price. Everything he writes will be in Blue so you can easily see which parts are his! If you like posts that involve Haydn be sure to like and comment so we can do more in the future. To be fair Haydn is usually the one I go shopping with, so he should be at an advantage but we all know he’s not going to have paid attention to the prices; I’ll give £1 leeway to help him out. 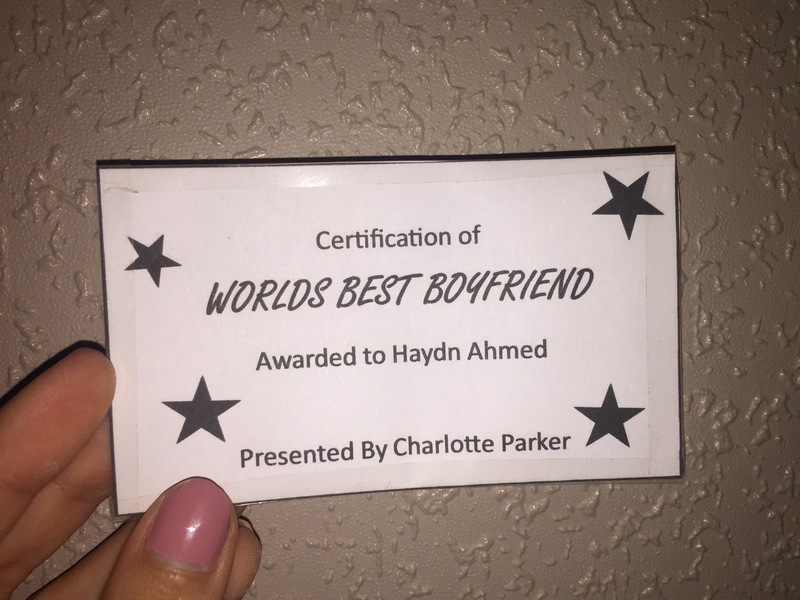 To make things a little bit more interesting I created a mini ‘worlds best boyfriend/girlfriend’ certificate. The certificate is double sided with girlfriend on one side and boyfriend on the other, the winner will be able to display their side on our Instagram account @211_miles. Obviously this is a joke and not something we’re taking seriously but if we do end up doing more couples challenges it’d be fun to keep this as an ongoing thing. In order for Haydn to win he’ll need to guess 4 or more product prices correctly; if he gets less than 4 he’ll be naming me ‘Worlds Best Girlfriend’! Woah that was a long intro… time to get into this! First up I’ve got the Collection mattifying primer. I don’t really use a primer under my makeup as I don’t find it to make that much difference. I doubt Haydn will even know what this is. Small so I don’t think it’s bare expensive but I do think it’s important. The foundation I’ve decided on is my trusty Maybelline Fit Me Matte and poreless. I’ve raved about this 100 times and so Haydn should definitely know this is from the drugstore. Bit pricey cuz it’s foundation. Key element to the makeup look so I assume that makes it more expensive. For concealer I’ve chosen to show Haydn my true love, Collection lasting perfection concealer. If he’s paid attention to the price of the last Collection he might be able to fall pretty close to this one! Concealer you only use a little of so it’ll last a while and it lasts for 16 hours so would be a bit more. Lasts a while so it’s more expensive. Usually I wouldn’t use a contour/bronzer and a blush but seeing as this is full face I’ve decided to go for both. Starting with my contour – which is more like bronzer because I can’t contour – I’ve used the Collection highlight and sculpt palette. I know I’m using a lot of Collection products but I promise this is the last one! Double products in it so for like £4 each that’s about right. Now to add colour to the cheek I’ve decided to add my Benefit Rocketure blusher. This is the first high end product I’ve shown Haydn but will he know that this is a more pricey piece? It’s benefit so its expensive. You’re a freak you need to stop spending so much money on that! Of course we have to add highlight! I’ve decided to use my all time favourite Lottie London Shimmer Squad palette. I seriously think the four different colour choices will throw Haydn off. I thought we’d throw in another high end brand for my eye look but because the Tarte Tease palette is so small I think he’ll under-estimate the price. After all this palette does only have 6 shades. I’ve heard good things about Tarte. It smells good, like sweets! The add volume to my lashes I’ve gone for the L’Oreal Miss Baby Roll mascara. I’ve done an entire review on this product right here on my blog – which I know Haydn reads – if he’s paid attention he might smash this one! Okay L’Oreal I’m saying that’s a budget thing. I’ve decided to include my Lush bubblegum lip scrub because whilst it’s not exactly makeup I do use it pretty much everyday. Haydn should be good at this because he brought me the ‘Santa Baby’ around Christmas last year. I didn’t bring any lip liners with me so I’ve decided to put in the Barry M metallic lip kit. 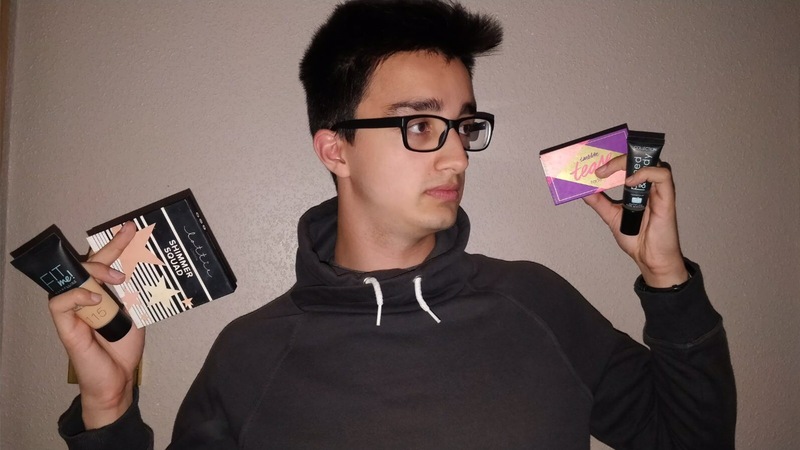 The lip liners and liquid lipstick in one box might throw Haydn Of on the price but we’ll see what he thinks! Thank you all for reading, congrats on getting all the way through. Don’t forget to like and comment if you enjoyed the post with Haydn!